Costs – Find out more information on the average costs of tree pruning, stump removal and tree removal in Edmonton, AB. FAQs – Are you in touch with the local tree regulations in Edmonton? If you’re looking to plant or remove a tree, make sure you’re in the know about these local tree facts. Services – Find an arborist today. How Much Do Tree Services Cost in Edmonton? While Edmonton has milder winters than some of its neighboring Canadian cities, the climate is still cold with low precipitation for much of the year. However, there are a staggering number of trees that thrive in this environment. The following breakdown of popular services can help homeowners understand how to best care for and maintain the trees on their properties. Removing large or small trees can be a big job, and many property owners prefer to leave the task to professional tree removal companies who charge $80 to $150. Generally, these professionals will come in and tether the tree before cutting or sawing it down. This helps to ensure that the tree falls in a safe direction away from houses or any other structures. For an additional fee, professionals will cut up the tree into useable pieces, stack the wood or haul it all away. Unless property owners have large commercial stump grinders, the process of removal can take significant time and energy, and there may still not be a finished look where the stump once was. Professionals can use a large grinder around the diameter of the stump to remove it entirely in a matter of minutes for around $400 to $600. Since Edmonton has little rainfall, pruning is vital when it comes to ensuring that particular trees have the hydration they need. Professionals with knowledge about native trees can accurately prune where needed without damaging the tree or removing any necessary branches for between $588 and $796. Edmonton, located in the Canadian province of Alberta, is classified as having a humid continental climate. Summer temperatures are very mild, but winters can be harsh. Despite that fact, Edmonton is full of lush greenery. In fact, the city is home to more parkland than any other city in Canada. Whether property owners want to pick native trees when landscaping newly-purchased property or they simply want to care properly for their existing trees, this guide can help. The City of Edmonton has a number of measures in place to ensure that the trees making the city so beautiful remain in place for as long as possible. To that end, the city provides residents with the services of an urban forester at no charge. These individuals can take a look at a person’s property and determine the best way to build or remodel a structure and still keep as many trees as possible. Anyone who wants to remove a tree from their property will have to contact one of these urban foresters to determine if it can be safely done and whether removing one tree means that another needs to be planted as a replacement. If tree removal is deemed necessary, homeowners should avoid both the middle of summer and the middle of winter, which is when the ground can freeze. One of the major electricity providers in Edmonton is Direct Energy, which maintains miles of overhead power lines in the region. In order to keep customers and residents safe, Direct Energy recommends that individuals should not come within 15 feet of an overhead power line. For that reason, among others, residents should not plant large trees underneath or near power lines. Instead, choose shrubs or trees that mature at a maximum of 20 feet in total height. 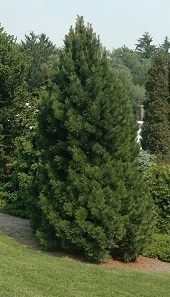 While the city of Edmonton does not have an official tree, the province of Alberta is represented by the Pinus Cortorta. Know commonly as the lodgepole pine, it is an evergreen conifer found throughout the region as well as much of Western and Central North America. Although the largest tree in Canada is almost a thousand miles away in British Columbia, Edmonton is still home to some impressively tall trees. 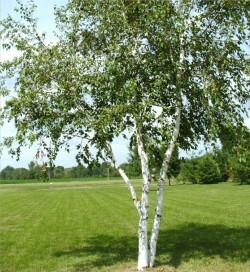 One of the largest is a balsam poplar that stands at a height of over 130 feet, or 39.8 meters. Some of the most common short trees in Edmonton include Swiss stone pine, which mature at less than 25 feet, and the Thunderchild crabapple, which grow to heights of roughly 10 feet in maturity. Every location on the planet is given a USDA hardiness zone ranking, and that number determines the climate as well as what trees will grow best in the region. In Edmonton, that classification is 3a, which is due in large part to the potential of sub-zero winter temperatures. For that reason, residents looking to new trees for Edmonton should stick to trees with similar rankings, as anything far above or below won’t be able to thrive.